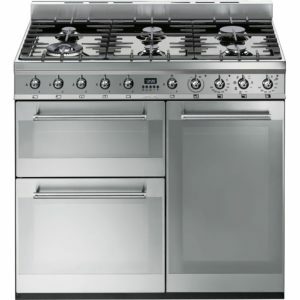 This gas on glass range cooker looks super stylish with the glass hob top, sporting five burners including the incredibly strong Power Wok Plus, and modern stainless steel finish with mirror glass doors. With so many cooking features available, you can be sure to impress with your creations. The huge 79 litre capacity "Titan" tall oven can be split into two compartments thanks to the Pro Flex system, with no transfer of odour or flavour between compartments. You can pick one of 13 functions in the fantastic main oven, and when you can't get to the oven but need to check the timer, that isn't a problem thanks to Zeus bluetooth connectivity. If healthy eating is your thing, then say hello to the brilliant Steam & Infuse cooking system; simply pop your ingredients into the supplied dish and steam created naturally will cook thoroughly while maintaining taste and nutrition. RANGE300 USE THIS CODE AND GET A FURTHER £300 DISCOUNT! Belling cookers are made in Britain and full of features, so you are sure to be impressed with this 90cm range cooker in stunning silver. With two electric ovens, a five burner gas hob and separate grill, your cooking will be a breeze. 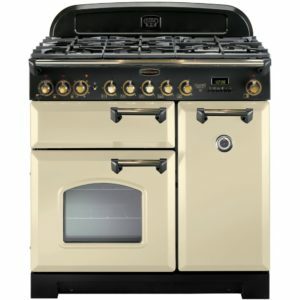 This cooker also features an easy clean enamel interior so you can keep it looking as good as new. The energy efficiency rating on this model is A/A and it comes with a one year parts and labour warranty as standard. 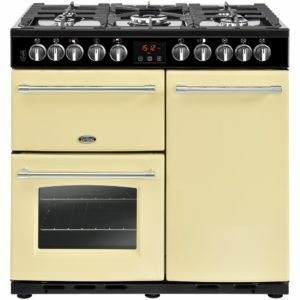 The traditional design of the Rangemaster Classic Deluxe looks wonderful with a cream finish and brass trim. Not just attractive but with an incredible multifunction oven, secondary electric oven and glide out grill you can cook with ease. Completed with a five burner gas hob top complete with wok burner you will never need to struggle for pan space! 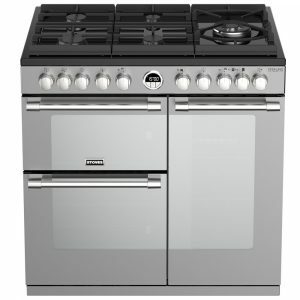 Stylish and functional, this fantastic Sterling Deluxe range cooker from Stoves certainly ticks all the boxes. The fantastic "Titan" tall oven offers an astounding 79 litres of capacity, and using the Pro Flex system, this can be divided into two compartments for great flexibility. The brilliant main oven offers 13 cooking functions and with a separate grill compartment you are spoilt for choice! When you can't reach the front of the cooker you can check the timer with Zeus bluetooth connectivity, perfect if you are busy in another room. Using the Steam & Infuse cooking system, you can make tasty and healthy food by popping the ingredients in the supplied dish. Finished in black with mirrored glass it will turn heads when in your kitchen. 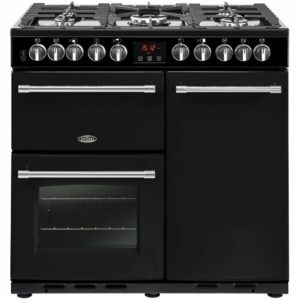 Belling's amazing 90cm range cooker in black really has a lot to shout about. Made here on British soil, it is full of handy features, great for every level of cook. 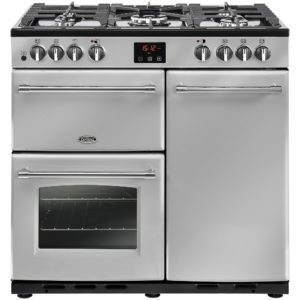 With its five burner gas hob, multifunction main oven, tall fan oven and small conventional oven and grill, you'll have plenty of space and flexibility to cook to your heart's desire. 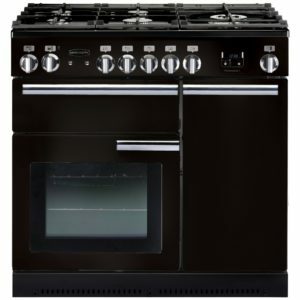 The FARMHOUSE DX 90DFTBLK also features an easy clean enamel interior so you can keep your oven as good as new. The energy efficiency rating on this model is A/A and it comes with a one year parts and labour warranty as standard. 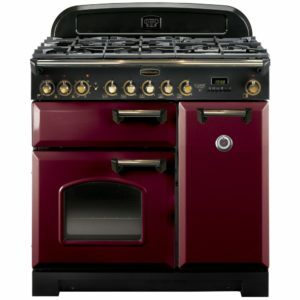 British made and fantastic quality, this range cooker from Rangemaster could be the perfect addition to your kitchen. Offering two electric ovens, a separate grill and a five burner gas hob including a triple ring wok burner, the PROP90DFFGB/C gives you all the flexibility you need to cook up a feast. Sunday dinners are a breeze thanks to the unique HandyRack located on the inside of the oven door giving you easy access to check and tend to your roasts. This model is finished in gloss black, has an energy efficiency rating of A/A and comes with a two year parts and labour warranty as standard. Proudly presenting this striking cream range cooker from Belling! Made here on British soil and full of handy features, there's a lot to love about this cooker. 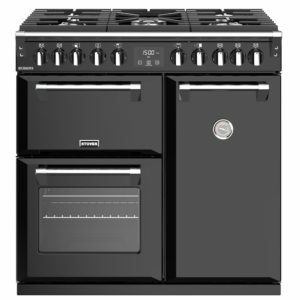 With its five burner gas hob, multifunction main oven, tall fan oven and small conventional oven and grill, you'll have plenty of space and flexibility to cook to your heart's desire. The FARMHOUSE DX 90DFTCRM also features an easy clean enamel interior so you can keep your oven as good as new. The energy efficiency rating on this model is A/A and it comes with a one year parts and labour warranty as standard. We love this Cranberry finished Classic Deluxe model from Rangemaster. Gorgeous design and brass trims add a touch of class. Not just attractive it is also incredibly functional with a multifunctional main oven, secondary oven, five gas burners and wok burner with cradle. You can easily create your favourite dishes with so may options! The energy efficiency rating on this model is a brilliant A/A and it comes with a two year parts and labour warranty as standard for added peace of mind. 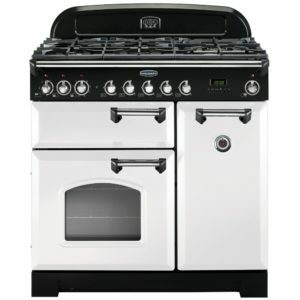 This stunning 90cm wide range cooker from Rangemaster looks fantastic with its traditional style and chrome trim. For the aspiring chef there's plenty of features that mean you can create your favourite meals, and if you are more of a novice, with its handy extras like the glide out grill, easy clean oven liners and A/A energy rating you still get all the best options. Look out for the multifunction oven, five burner hob and griddle to impress guests with! Supplied with a two year standard warranty you have that extra peace of mind as well. Smeg always offer us incredibly beautiful appliances loaded with clever technology and this Symphony dual fuel range cooker is no exception. 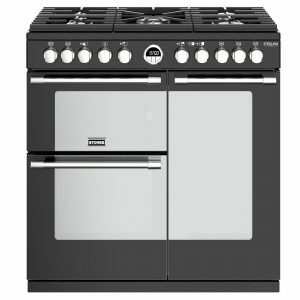 Technology with style is Smeg's mantra and looking at this range cooker, you'll understand why! On offer is an amazing 123 litres of oven space split between two ovens. You have the main oven with 9 cooking functions including Circulaire, a tall fan oven and a separate grill. You won't have to worry about cleaning the ovens as they come with easy clean enamel interiors which will simply require a wipe down. When you take into account 6 gas burners and a wok support, you will have so much cooking flexibility that your inner chef will just have to take over! Traditional style meets high performance in this cranberry red CDL90DFFCY/C range cooker from Rangemaster. Offering everything a traditional range cooker should - bevelled doors, arched windows and a handy towel rail, the Classic Deluxe is a perfect buy for those with more classic tastes. With two electric ovens, a responsive five burner gas hob and a separate grill you'll have all the tools you need to create delicious meals, whatever the occasion. Plus, the innovative Rapid Response function gives you 30% faster heat up times, so no waiting for preheating.